Over at WUWT, Willis has a “proof” that there is no periodic cycle in tides. He does this via an analysis of the tidal force, and shows that the size of it does not change in any repeating periodic way that provides an 18.6 or ‘near 60’ year period. Substantially his argument is of the form “the force does not change enough to matter”. My assertion is that this conclusion is based on an error of ‘kind’ in his analysis. He is looking at a vector quantity and only addressing the scalar portion of it. That is too narrow an analysis to find what, IMHO, matters. A scalar quantity has a size. That’s it. No direction. A vector quantity has both a size, and a direction. I go 20 miles per hour. That’s a scalar. I go 20 miles per hour due north. That’s a vector. Both size “20” and direction “north”. My assertion is that while “size doesn’t matter” in the tidal force scalar, direction does matter as it is a tidal forcing vector. It is the “direction” portion that makes the difference, and that “direction” does in fact have periods of 18.6 (ish) years and about 3 times that ( or about 55.6 years, though other physics will modulate that somewhat once land and topology are added in). First up, the prior postings: I have looked at other bits of lunar / tidal “stuff” in several postings. If you have any notion that centrifugal “force” is involved in the tides, or that rotation really is what matters, please read that link. All that really matters is the gravity vector and how it diminishes with distance. Rotation does have an impact once continents are involved (in that the oceanic ‘tidal bulge’ can’t just run through them) but it does not have anything to do with generating the tidal force. OK, with that preamble, on to the “why the vector part matters”. Even in that excellent link on “misconceptions about tides”, they show a simplified picture of the tidal force on the planet. This is the net-net force acting on water after all the Earth gravity, Luna gravity, etc. etc. are netted out. This is what actually moves the water. The basic notion being presented is that gravity pulls the side closest to the satellite toward it, and as gravity falls off with distance, the net gravity is lower on the far side. There is also a ‘tractional’ force pulling sideways at the poles. This tractional force pulls water away from the poles, toward the two bulges. The one toward the satellite from more gravitational pull, and the one away from the satellite due to lower gravitational pull. So far, so good. At least it avoids the mistaken notions that anything other than gravity is at work. (Be it “inertia” or “centrifugal force” or any other kind of red herring.) BUT, it ignores the fact that the satellite, in the case of the Earth / Moon system, is NOT stuck in the equatorial plane. So, in reality, lunar tidal force wanders about 37 degrees back and forth on a N/S line at low times and up to 57 at times of large variation. (That is, 23.5 – 5 = 18.5, then 18.5 x 2 = 37 for the full range. Similarly, 23.5 + 5 = 28.5 when Lunar Declination to the ecliptic adds to our ’tilt’ for 57 degrees total range). This cycle of a 37 degree wobble happens each lunar month (one cycle of the moon ‘around’ the earth). Same thing for the 57 degree range when things align the other way. This change from 37 to 57 takes about one Earth year (as the Moon orbits the sun at the same pace we do, but goes above / below the ecliptic). So on a yearly period, we have a “delta” of 20 degrees in the “alignment” of our moon with the Earth axis. In the following two images, I’ve taken that simple image above and tilted it by +/- 18.5 and then +/- 28.5 degrees. That’s what the Earth really sees in term of ‘tidal force’ on a monthly cycle during the two ranges of alignment of lunar ecliptic displacement and our polar axis alignment. Tidal Force at 18.5 degree lunar excursion, 37 degree total range. At first blush, they don’t look all THAT different, but look a bit closer. For example, look at the North Pole. In the low range case, the vector points more ‘up and down’. Rising and falling. In the wider range, the vector goes to nearly tangential. Flushing water in and out. Think having more warm lower latitude water flushing into and out of the arctic might matter to ice melt? Think more lateral displacement might impact the Gulf Stream and just where it lands on Europe? That the wider displacement has more potential to disrupt such a flow into vortex whorls and less tendency to let it run straight? Tides in many cases drive currents (more on that later), so there ought to be wide spread changes in the size and location of currents, especially near continental shelves. Precession is the rotation of a plane (or its associated perpendicular axis) with respect to a reference plane. The orbit of the Moon has two important such precessional motions. First, the long axis (line of the apsides: perigee and apogee) of the Moon’s elliptical orbit precesses eastward by one full cycle in just under 9 years. It is caused by the solar tide. This is the reason that an anomalistic month (the period of time that the Moon moves from the perigee to the apogee and to the perigee again) is longer than the sidereal month (the period of time when the Moon completes one revolution with respect to the fixed stars). This apsidal precession completes one rotation in the same time as the number of sidereal months exceeds the number of anomalistic months by exactly one, after about 3233 days (8.85 years). Another precession is the turning of lunar orbit, the orientation of lunar orbit inclination. This motion determines the period of the lunar nodes; that is, the line along which the plane of the Moon’s orbit and that of Earth’s orbit intersect. This nodal period is about twice as long (about 18.6 years) as the apsidal precession period discussed above, and the direction of motion is Westward. This is the reason that a draconic month (the period of time that the Moon takes to return to the same node) is shorter than the sidereal month. After one nodal precession period, the number of draconic months exceeds the number of sidereal months by exactly one. This period is about 6793 days (18.60 years). As a result of this nodal precession, the time for the Sun-Earth-Moon alignment to return to the same node, the eclipse year, is about 18.6377 days shorter than a sidereal year. 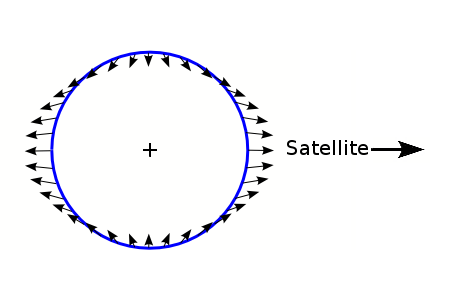 The number of solar orbits during one turn of lunar orbit equals the period of orbit divided by this difference minus one. So the season when that major vs minor tidal force arrives changes on about an 18 year cycle. That “where is the vector when?” will change what tides and currents happen, where and when. I think this matters. More, or less, Arctic flushing in summer vs winter. Stronger, or weaker, currents in the summer vs winter taking heat toward the poles, or not. Now notice the “bulge” part. The Earth is about 1/3 of a rotation off at each 18.6 year ‘repeat’ of the Lunar tidal force from the Saros cycle (alignments of the Sun, Moon, and Earth on the Ecliptic). That means that roughly each 55.8 years, that “bulge” arrives over the same patch of the Earth. That tidal bulge will have significantly different effects if it is over Asia than if it is over the Pacific Ocean. So that annual change might be more extreme when Asia is in winter, or when Australia is in winter, and it lands on top of them. The 18.6 year cycle isn’t just eclipse alignments, it is also the alignment of apogee / perigee of the moon with the Earth / Sun line (just offset by part of an orbit). As that happens, both angular velocity of the moon changes, and actual tide force changes ( up to 40% per a below reference). So you can have that more / less tide force showing up over any 1/3 rotation displacement location as the 3 x cycle happens. (As it isn’t EXACTLY 1/3, even this will slowly drift as to exactly which land / sea is at the alignment over very long cycles. Yet another “dig here” to calculate; but it will be a very long cycle). (Note that they use 18.03 year period. I’ve not yet worked out why some folks use 18.03 while others use 18.6 though I do know why the two periods exist. They measure slightly different things. Until it can be sorted out which alignments really are driving things, I’m basically ignoring those decimal place variations.) So is it actual position? Or the change in angular velocity? I’m leaving that as a ‘dig here’. They both come about the same time period anyway, and the .03 vs .6 is down near the error band of what timing data we have on historical climate cycles; so rather than run down that rabbit hole right now, I’m leaving it for later. So in their paper they look at angular velocity (how fast the moon runs from one place to another) and I’m looking at where the moon is and how far it goes in a month. Not that much difference, really. For the average 1470 year cycle (that has nodes at 1800 and 1200 year ranges so the 1470 is only an average) the monthly changes or even the 18 ish year changes are not as important. My belief is that on the very long ranges, it is a ‘beat’ of some shorter cycles, or the Keeling and Whorf folks have it right that the alignments of Sun and Moon at perigee with greatest angular velocity add even more tidal force to the action. But that longer cycle is not the topic right now. We still have the 18 ish year cycle of more / less “flushing” of the Arctic and more / less ocean current creation and disruption; but it gets a ‘size kicker’ from even faster angular velocity changes and even stronger gravitational forces at closest approach of the Sun and Moon to the earth. So we have a ‘vector metronome’ that changes size by a net 20 degrees on the angle of the Luna gravity vector. We have 9 and 18 year drift of that effect relative to the seasons. We have a 3 x that beat frequency on the continental effects on currents and tides as land masses line up, or don’t, with the peak tide bulges when the moon and sun align (ecliptic crossing), and we have a longer term interaction based on perigee alignments of Sun and Moon changing the distance. Take all those changes, shake and mix, and the resultant sloshing is the actual tide (modified by continent profiles…) I think that is more than ‘a trivial degree of change that can be dismissed’. It is all those vector portions that matter, not the scalar of lunar gravity variation. Add in some resonance of sloshing oceans and ground profile and you get a range of tides from near zero to near 50 feet at the Bay of Fundy. All from the same “nearly constant” tidal gravity scalar of the Moon. 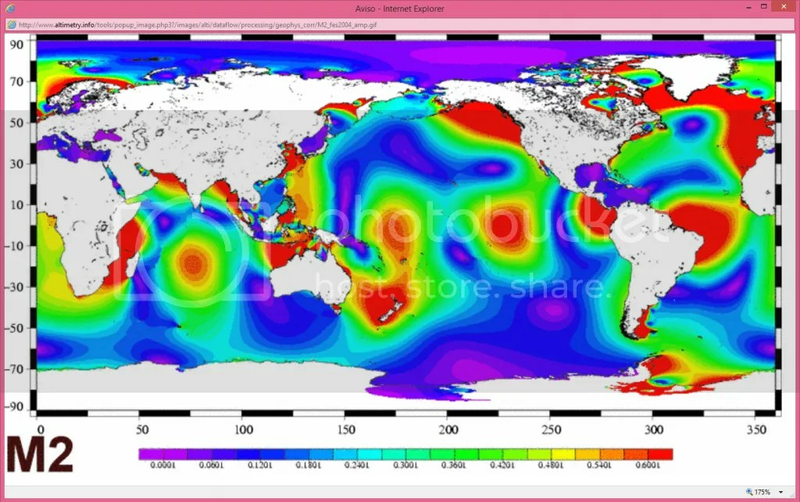 100 billion tonnes of water daily interactive tide animation Try our interactive tide animations! Each day 100 billion tonnes of seawater flows in and out of the Bay of Fundy during one tide cycle — more than the combined flow of the world’s freshwater rivers! That’s just ONE spot with tidal flow. Overall, the tides create a lot of tidal mixing (per the Keeling and Whorf paper, more than the winds) and creates many of the ocean currents. Change that, and weather will follow. These bulges distort the shape of the solid Earth, and also distort the oceans. If the oceans covered the entire Earth uniformly, this would almost be the end of the story. But there are land masses, and ocean basins in which the water is mostly confined as the Earth rotates. This is where rotation does come into play, but not because of inertial effects, as textbooks would have you think. Without continents, the water in the ocean would lag behind the rotation of the Earth, due to frictional effects. But with continents the water is forced to move with them. However, the frictional drag is still important. Water in ocean basins is forced to “slosh around”, reflecting from continental shelves, setting up ocean currents and standing waves that cause water level variations to be superimposed on the tidal bulges, and in many places, these are of greater amplitude than the tidal bulge variations. The pattern of tide-generating forces is coupled to the position of the moon ~and the sun! with respect to the earth. For any place on the earth’s surface, the relative position of the moon has an average periodicity of 24 h 50 min. The lunar tide-generating force experienced at any location has the same periodicity. When the moon is in the plane of the equator, the force runs through two identical cycles within this time interval because of the quadrupole symmetry of the global pattern of tidal forces. Consequently, the tidal period is 12 h 25 min in this case ~the period of the semidiurnal lunar tide!. However, the lunar orbit doesn’t lie in the plane of the equator, and the moon is alternately to the north and to the south of the equator. The daily rotation of the earth about an axis inclined to the lunar orbital plane introduces an asymmetry in the tides. This asymmetry is apparent as an inequality of the two successive cycles within 24 h 50 min. Similarly, the sun causes a semidiurnal solar tide with a 12-h period, and a diurnal solar tide with a 24-h period. In a complete description of the local variations of the tidal forces, still other partial tides play a role because of further inequalities in the orbital motions of the moon and the earth. In particular, the elliptical shape of the moon’s orbit produces a 40% difference between the lunar tidal forces at the perigee and apogee of the orbit. Also the inclination of the moon’s orbit varies periodically in the interval 18.3° – 28.6°, causing a partial tide with a period of 18.6 yr. The interference of the sun-induced tidal forces with the moon-induced tidal forces ~the lunar forces are about 2.2 times as strong! causes the regular variation of the tidal range between spring tide, when the range has its maximum ~occurring at a new moon and at a full moon, when the sun and moon are in the same or in the opposite directions!, and neap tide, when the range has its minimum ~which occurs at intermediate phases of the moon!. The amplitude of a spring tide may be 2.7 times the amplitude of a neap tide. Because the earth is not surrounded by an uninterrupted water envelope of equal depth, but rather has a very irregular geographic alternation of land and seas with complex floor geometry, the actual response of the oceans and seas to the tidal forces is extremely complex. Note that he uses more precise numbers of 18.3 and 28.6 instead of my simplified 18 1/2 and 28 1/2. Also note that the apogee / perigee change of the lunar position accounts for a 40% variation in tidal force. Exactly how lunar orbital eccentricity changes matters a great deal, and we don’t have a good handle on it, since Luna orbits the Sun, and not us. Eccentricity relative to us depends on Luna / Solar changes, stirred by the other planets. At any rate, the alignment of apogee / perigee with particular places on the Earth surface is going to mater to total tidal force, Arctic flushing activity, and current formation. Weather depends on all of those far more than on a trace gas of questionable effect in the air. To dismiss all these vector effects with a scalar wave of the hand is not the path to greater understanding. To assert that the effect is non-cyclical based on a particular transform on that scalar number is simplistic, at best. To ignore folks who clearly “have clue” stating that there is an 18.6 year minor tide cycle is being a bit intemperate at well. Clearly there IS an 18 ish year cycle detected by others. I choose not to ignore them. Enjoy your day, a gift of the sun. Then enjoy this evening with a nice full moon. And ponder what they do to our oceans. This entry was posted in AGW Science and Background, Science Bits and tagged Arctic, Luna, Lunar, Ocean, Scalar, sun, Tidal, Tides, Vector. Bookmark the permalink. Thanks for a well thought out analysis. 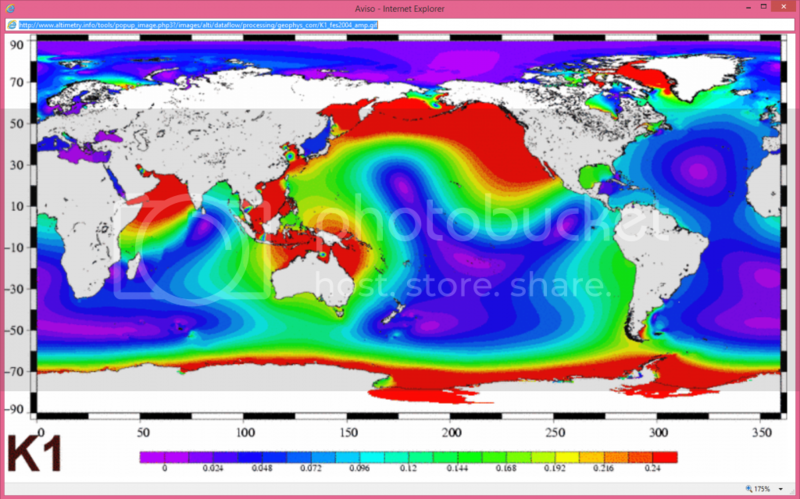 Someone recently posted real time global ocean currents from NOAA’s computers. Have you seen those? This is easy (for me) to agree with, but when you said “vector metronome”, I actually ‘saw’ it for the first time. That was pretty cool- thanks for that. It kinda makes sense as to why the ancients built alignment stones, other than not having anything else to do on clear sky nights (and without todays light pollution). It also makes sense as to why most of these align with the moon, and not the sun. Major and Minor Lunar Standstills have repercussions, and the ancients recorded them for a reason. Yes, I was puzzled that Willis only looked at scalars in that post. Thank you for an interesting post! One thing that seems to be missed in gravitational calculations is that every particle attracts every other particle, and that what we approximate as a point at the centre of gravity is in fact the vector sum of all the attractions of all the particles involved. Since gravitation as a force seems to have an infinite velocity of propagation and an infinite reach, that actually involves the whole universe. This is tacitly admitted in measurements of gravitation variance to find concentrations of mass in a planet and, for example, buried meteorites in a planet’s crust but people are taught the point approximations so it tends to be ignored. The direction of the pull seems a crazy thing to ignore, and given the obstructions of the various land-masses the water is obviously going to end up having a cyclic variation in local sea-level. Another complication to add is the variation of atmospheric pressure which will add to the movement of the water, and because this will be driven by the temperature differences in the water (that is driven by the tidal movements and thus they interact) the calculations are going to get really complex the more accurate a result you’re looking for. Those perturbations of the gravitational effects by the air-pressure will likely also be affected by variations in the solar output as received at the Earth, so even if the Sun remains at the same output we’ll have variations from the Earth’s orbital distance. With the long cycle variations and the poor quality of data before the advent of good satellite observations, it looks impossible to me that people can make accurate projections. It doesn’t seem to stop people telling us they have the absolute answers backed up with computer predictions, though. GIGO again. The eccentricity of the Earth’s orbit around the Sun? It may only be 1.03 at the present but that represents an annual variation of nearly 7% in the gravitational pull (and solar energy received. I note the similarity between your 54/55 year cycle and that of the (slightly variable) PDO. All interesting stuff, and much of it probably studied by the ancients but since been left on the shelf. My only concern is when variations of orbit, measured in fractions of a day, end up trying to say that a cycle of 55 years produces climate cycles of 60 years. There’s either some big variable that isn’t being added, or the tidal forces, no matter how much they vary, are coincidental. I have been trying to point out the problems with the overly simplitic description that Willis uses to no avail. There is one point you might like to consider also. There is a 4 year pattern to the series as well. In order for the Earth to get back to the same rotational position relative to the Sun we take 4 years, not 1. I suspect that the true Saros cycle is 4 * 18.6 years long with small variations in each year of the 4. Now given that others have found a 3 * 18.6 years cycle In some data, then the possibility that we have 3, 3.5 and 4 * 18.6 mixing in some way is just too big to ignore I suspect. Even JPL can’t tell you what the eccentricity of the moon relative to the earth will be over periods of 10’s of thousands of years. The 40% variation in lunar tides between perihelion and apogee will be amplified greatly by the 1/r^3 dependence for higher lunar eccentricity. Since we know that the earth follows 100,000 year Milankovitch cycles in eccentricity mainly caused by gravitational perturbations from Jupiter and Saturn, changes to the moon’s orbit must must be far greater ! @ E.M. Great posting, and wonderfully explained. Like several other commentators, I was surprised at Willis’s failure to account for the vector of the tidal forces. Willis has written some absolutely wonderful articles and has contributed mightily to the anti-CAGW arguments, but I think his analysis of tidal forces missed some important points. Well, even Einstein made mistakes, and Willis is still one of the greats. The infinite velocity of gravity is something I only found out about a few years ago. I had always assumed that gravity propagated at C. It was something of a surprise to sit down and look at the vectors involved. If objects (say a binary star system) are attracted to where their companion was a few minutes ago (i.e. if gravity is not instantaneous) there is always a tiny bit of that attraction vector which is aligned with the objects direction of motion. The two binary stars would speed up bit by bit by bit until they flew apart. Likewise, the earth would not be stable in its orbit and would be obviously faster in only a year or two. One’s first impulse is to say, “No, that is crazy! Gravitation is an inverse square law!” but that inverse is only true for point sources. This is exactly analogous to the near-field correction needed for calculating electromagnetic forces near large antennas, or for calculating lighting near an extensive, non-point light source. Like all of physics, the thing that make our equations valuable is that we are often able to simplify our experiments in such a way that we are able to do the math. As soon as the experiment is more complicated we are on shaky ground. I just wish that the CAGW enthusiasts would realize that climate is not as simple as they think. Jason – thanks for the extra thoughts about shapes that I hadn’t thought of. With the infinite plane, when we are standing on the ground we approximate that, so the gravity when we are the surface of the planet is actually less than it would be when seen from a greater height. The inverse-square law only gets to be reasonably accurate when the angle subtended by each object on the other becomes reasonably small. When we look at the Sun or Moon, the angle is about 0.5° so it is pretty close. From Mercury, the Sun is much bigger, so the effective gravity must be lower and the square law is not accurate enough any longer. I think this may be enough to explain the precession of Mercury’s orbit, but so far the integrals needed have defeated me. It’s possible that General Relativity may not be needed to explain it, and the old square law could work if the corrections for non-point objects were properly calculated. If you look at the Quantum Theory explanation of the universe, then gravity has to be of infinite velocity to avoid logical errors. Not that the universe has to be logical, of course…. Have you noticed the study showing how weather on MARS depends on solar tides? Thanks for additional thoughtfulness from an adult in the room. I can’t deeply appreciate the work with scientific data or the mathematical formulas, but I can enjoy the depth of thinking and the kindness with which you encounter Willis’ impetuousness — and how you offer direction for more complex ideas that meet the real world. I forward these posts to friends and family who appreciate them more and more. I hope “things” are going well in Florida; it seems that job responsibilities are giving you more time to post. All the better for us. Best wishes to you and your family. Yes, exactly — and I wish I had said it so clearly and simply! As for the infinite speed of gravity, classical physics is plenty for that, no quantum effects needed. “Gravity” propagates at the speed of light. Gravity waves are a prediction of general relativity. Gravitons are the quanta like photons are for E-M field. None have been observed so far because Gravity is so weak compared to other forces something like 10^-40 times weaker. pg – a couple of lnks. You won’t have to do it yourself…. @Simon; Interesting reads, the use of the close orbiting dwarfs would give gravity caused wave like results in the stellar medium. I don’t see how that would prove actual gravity to be a wave function.More like wind caused waves being used to prove the existence of acoustic waves in an ocean. Personally I fail to see how gravity could function as it does as a wave. But it could cause wave like effects in the medium of space. The medium does have mass/inertia so it must be effected by gravity and exhibits gravity effects on its’ own at galactic size regions. Jason – there’s also a bit of fun looking at an annulus in that you could get a linear “orbit” of a small mass falling through the middle of it. pg – the problem with the velocity is one of the things that makes me think that gravity and electromagnetism are not connected. I’ll send you an email rather than hijack EM’s thread any further. On-topic, I can’t help thinking that the Wiki diagram of net forces must be an approximation to end up with such a nice smooth ellipse. It seems to me that it ought to be more egg-shaped, with a sharper point pointing to the Moon than away from it and the vectors at top and bottom should be off-vertical. It looks to me that it was calculated using point masses at the centres of gravity, and as we’ve noted that approximation may not be good enough. Nice article – very thoughtful and informative. If any of you are interested, a few years ago Eric Mills published a history of attempts to explain tides and currents etc. It does not deal with tides specifically, but it does highlight all the problems encountered in trying to explain the origins and physics of complex ocean currents. It’s called The Fluid Envelope of our Planet: How the Study of Ocean Currents Became a Science . It gives a nice background of all the complications that need to be addressed and clarified to understand the dynamics of the semi-chaotic ocean environment, and could be read as an antidote to the occasionally Aristotelian science one encounters at WUWT (by which I mean the belief that common sense can solve all theoretical problems). It’s telling that similar sorts of debates to the modern climate wars and the one being addressed in this post happened in oceanography in the 19th century. A linear orbit inside a doughnut! Ha! Yes, that would work. Wonder if it is stable? But E.M. has me thinking about tides, and your remarks have gotten me thinking about shapes. Tidal forces are just the first derivative of gravitational forces, the gradient of gravity, so to speak. And gravitational forces vary according to the mass distribution of the object considered… Hang on, I may have a GREAT thought here! (Or I may be going stupid again. Hard to tell the difference some days!) Any way consider this. OK, for point masses, gravity varies as an inverse square of distance (negative two power). For one dimensional arrangements of mass, gravity varies as an inverse of distance (negative one power). For two dimensional arrangements of mass, gravity is a constant ( zeroth power of distance). Now for tidal forces, in each case, the tidal force is a stretching force and has a power function one less than the gravity. For example, for regular “point source” planets, tides are a stretching force of minus third power of distance. For “infinite rods” tides would be a stretching force of minus two power of distance. For “infinite sheets” tidal forces would be a stretching force of minus one power of distance – not that it matters in that case because since gravity is constant for that, then the tidal magnitude is zero. Now for the fun part! Consider an infinite (OK, not infinite – but very big!) arrangement of stars, a three dimensional array of stars. (Sounds like something I saw in the sky not long ago…) Gravitational forces are still positive toward the center of mass (wherever that is), but they get greater the farther you go from the center. This is analogous to the question of what gravitational force we would experience inside a sphere; normal near the sphere’s surface but declining to zero as we approached the center. Well, what about tidal forces? They are no longer a stretching force since the power factor of gravitational gradient is no longer a negative exponent. Tidal forces have turned into a compressive force. But now they have become a zeroth power of distance; in other words they have become constant throughout space. Every point in space will experience a tidal force attempting to compress the array together. The tidal force will be a compressive force, present through out space, and constant at all points but with a strength dependent on the average mass density of the array. Have I just discovered why globular star clusters hold together? Thanks EM. It’s always a pleasure to visit your site and read your thoughtful posts and the generally polite follow on comments. Jason – In a galaxy where the stars are all travelling around a common centre, unlike with the Sun and planets where the further you are from the Sun the slower the actual speed of the orbit, with the galaxy it’s noted that the orbital speed tends to be constant. If you approximate the stars to an average density, then at a certain radius then the gravitational effect of all the stars outside that radius will average to zero, and that star will see the effective mass it is orbiting as the sum of the stars inside its own radius. Thus as the radius increases, the mass contained within it increases as the cube of the radius and the orbital speed remains constant. You also have a contribution from the black hole at the centre in most galaxies so a bigger mass density there, so there is a tail-off in orbital speed because of that. I’ve seen that “constant velocity” observation put forward as the justification for Dark Matter, but looked at from a mass density point of view you don’t really need Dark Matter with strange properties but just stuff that isn’t hot enough to see. Chapter 3 of my autobiography (in process) will address the differences between pre- and post-WWII science. In the early part of the 20th century Einstein, Planck and Aston were able to appreciate god-like qualities in the force that sustains our lives and the vibrant universe. FEAR of the force in cores of Uranium and Plutonium atoms that destroyed Hiroshima and Nagasaki on 6 and 9 August 1945, convinced world leaders to hide the force and blocked post-WWII scientists from . . . APPRECIATION of creative intelligence in the force in the Sun’s core that made our elements, birthed the Solar System, and sustained the origin and evolution of life. “To be able to appreciate god-like qualities in the force that sustains our lives and the vibrant universe” is to acquire incredible courage to confront wannabe world tyrants with empirical facts about reality ! 2. Long-range attractive forces between atoms cause collapse of expanded matter. Very interesting article E. M. Thanks for the insights, also from the posters. .
What is way out with the radiative greenhouse calculations is well explained in a comment on WUWT which points out that a blackbody by definition absorbs all radiation and does not transmit any. But the surface of the oceans (say 1mm deep) obviously does transmit most of the radiation which then warms layers below. So the surface of the ocean is not a blackbody and it would require far more radiation than the SBL calculations indicate to raise its temperature to the observed level. As I have been saying, there is obviously nowhere near enough direct solar radiation reaching the Venus surface either. So obviously there is a non-radiative supply of energy as well as the direct radiation and these work together to raise the surface temperatures to what is observed. Remember, back radiation can only slow radiative cooling: it cannot actually add thermal energy (like the Sun does) or raise the surface temperature. The non-radiative supply of energy is actually energy that has been trapped over the life of the planet by the gravitationally induced temperature gradient, and more can always be added to the troposphere by the Sun. The key to understanding how this energy actually transfers from the colder atmosphere to the warmer surface lies in understanding thermodynamic equilibrium and the isentropic state, all of which is explained in my book “Why it’s not carbon dioxide after all” available through Amazon late April. Almost immediately after Chapter 2 of my autobiography confronted the scientific community with nine pages of precise experimental data that falsify their standard models, . . . Experts changed their opinion about stellar energy and diplomatically claimed they already knew the truth 40 years ago. It claims “. . . tides tend to be greatest annually at the equinoxes (March and September), particularly during the fall equinox, ” among other interesting things. So, . . .
~~I’m struggling to catch up with this and many other interesting things happening – and I’m not working full time! ~~Note that all but the left coast of North America is going cold again this coming week. Likely be freezing in N. FL. by next Thur/Fri. Thanks, E.M. Smith, for all your efforts. One or two of the great lakes have a small measurable tide. Oddly it runs away from the moon, perhaps this is the reason the tides are predicted by precedent and not gravity. Hey! I’m this guy: http://stevekluge.com/geoscience/images/tides.html, and read your post with interest. What’s really interesting about the tides, to me anyway, is that if you sit on the shore and watch them ebb and flood, things are very different than what our simple models predict. The model of two neat tidal bulges really only works on a planet that is entirely covered by an ocean of uniform depth, with a frictionless bottom! In Ocean City, NJ, for instance, on the day of the Full Moon this month (May 14, 2014), high tides occur at 8:35 AM EDT and 8:56 PM EDT, not at (as our bulge model predicts) at moon transit (12;24 AM) and solar noon (12:55 PM). In fact, the tides of the North Atlantic more nearly resemble a giant, counterclockwise rotating wave, influenced in part by the shape of the coastline and seafloor and Earth’s rotation.